Holiday.gr - Santa maria, a trip to a myth! The beach of Santa Maria is only 2km from Naoussa. 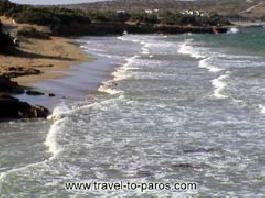 It is located in an exceptional position and distinguishes for its blond beach and clear waters. It is ideal for those avoiding crowded beaches. Although it's not among the cosmopolitan beaches of Paros, it's highly organized and lovers of windsurfing can practice there. In the, small and away from the winds, port romantics can live unforgettable times under the Aegean sun. Been to Santa maria ? Share your experiences!